Atlantic Shores Retirement Community on Forefront of Hearing Technology in Partnership with Healthy Hearing Now! Tech-forward community installs customized audio system to maximize hearing quality for residents. 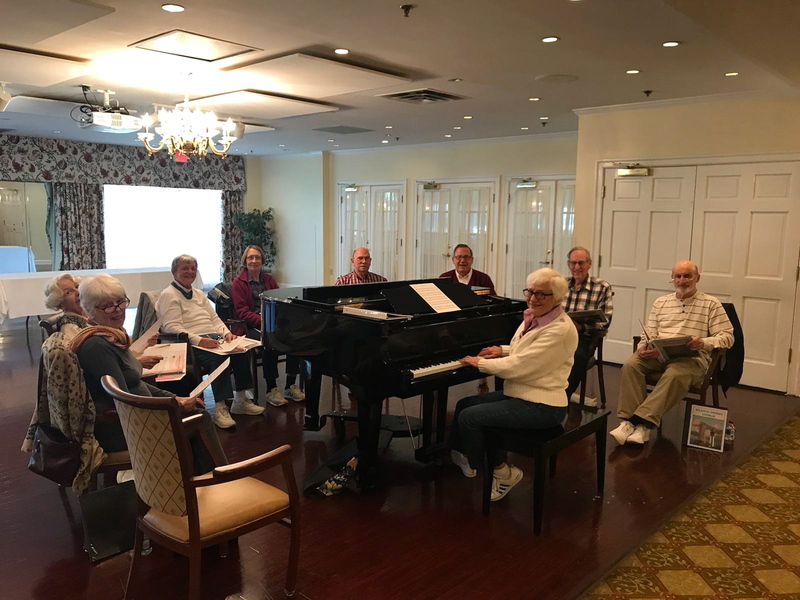 Atlantic Shores Retirement Community in Virginia Beach, Virginia has embarked on a life changing technology initiative designed to boost hearing quality in hard-to-hear environments on their 100-acre campus. Installation of a customized system combining two technologies is helping residents with hearing difficulties understand, participate in, and enjoy everyday social activities more completely. Equipment and installation for the initial system was donated by Healthy Hearing Now!, a small family owned hearing aid company in Virginia Beach. Today’s hearing aids are technological wonders that can reduce background noise and help people hear with incredible clarity. But for some, that still is not enough, with acoustics remaining problematic, especially in meeting or dining rooms. Atlantic Shores’ Anchor Room, a hub for activities and presentations, has been equipped with a Hearing Loop system, which delivers a broadcast quality signal customized to each listener. This “induction loop” system is a loop of wire installed around the room and then connected to the sound system. Audio is broadcast via electromagnetic signal to residents wearing hearing aids equipped with telecoils (T-Coils), or special headsets. The end result is the ability to hear any sound broadcast through the system with amazing clarity, and without background noise -- allowing residents to thoroughly enjoy movies, speakers, live concerts, and class instruction with their own customized sound. Similar systems are installed worldwide in churches, college lecture halls including the University of Virginia, and other large venues. The Chesapeake Room, the community’s main room for daily dining and monthly meetings, has been outfitted with a portable RogerTouchscreen microphone and associated Roger MyLink receiver. This system allows residents dining together at the same table to converse and hear each other using a Roger Touchscreen Mic sitting in the center of the table. This technology is accessed by residents who have a T-coil in their hearing aids by placing a Roger Mylink around their neck, and accessing the T-coil program in their hearing aid. The system’s advanced technology keeps conversation at each table distinct from background noise in the rest of the room. This system also gives residents without hearing aids the ability to wear headphones and experience the same sound clarity their friends with T-coils do, depending on their degree of hearing loss. By employing both technologies, Atlantic Shores is able to accommodate residents in a variety of campus facility spaces, with the loop system designed for a single speaker talking to a group of listeners, and the Roger system used for both large group presentations, as well as residents in personal conversations. Reprogramming of existing facility microphones allows them to integrate with the new technologies. These innovative systems were initially reviewed by Atlantic Shores staff and the community’s Resident Technology Committee, who quickly agreed to partner with Healthy Hearing Now! to improve quality of life for their fellow residents. Installation of the systems was completed by Hearing Technologies in Virginia Beach. People with auditory atrophy -- hearing loss paired with a compromised ability to recognize and process speech -- are especially prone to social isolation. Many stop attending activities they used to love going to. This leads to reduced quality of life, increased isolation and cognitive decline. Seniors with hearing loss are also significantly more likely to develop dementia over time than those who retain their hearing, a study by Johns Hopkins and National Institute on Aging researchers suggests. Using data from the Baltimore Longitudinal Study on Aging (BLSA), study leader Frank Lin, M.D., Ph.D. found that study participants with mild, moderate, and severe hearing loss had twofold, threefold, and fivefold, respectively, the risk of developing dementia. Moving forward, special seminars and a designated staff ambassador will educate residents, family members and fellow staff on the benefits of the systems, how to pair them with current devices, and how residents can maximize their communication lifestyle. In addition to current monthly hearing testing provided, on-site hearing screenings, equipment troubleshooting and maintenance will also be provided by Healthy Hearing Now! And to demonstrate how the looping technology can also make a difference for residents in their own homes, Atlantic Shores will be installing a personal loop in one of their model home units. This joint initiative blends a commitment by Healthy Hearing Now! to help others by providing technology and specialized services, with Atlantic Shores’ mission to provide high quality housing, supportive services and healthcare while fostering an environment which ensures freedom, dignity, independence and security for all residents. For more information on Atlantic Shores, visit http://www.atlanticshoresliving.com. And learn more about Healthy Hearing Now! at http://www.healthyhearingnow.com.